This interesting name is of locational origin from a place called Harefield in Middlesex. It may derive from the Old English pre 7th Century 'Herefeld', here, army, multitude, plus 'feld' plain, field, hence 'field of the army or of the people'. The surname was first recorded at the end of the 16th Century (see below). Locational surnames were usually acquired by the lord of the manor and especially by those former inhabitants of a place who moved to another area and were thereafter best identified by the name of their birthplace. 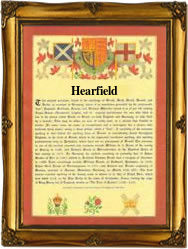 One Francis Hearfield was christened on April 17th 1597 in Fewston, Yorkshire. On October 26th 1617, John Hearfield married Agnes Hill in Hampswaite, Yorkshire. The first recorded spelling of the family name is shown to be that of Jane Hearfield (marriage), which was dated November 12th 1594, Church Records of Fewston, Yorkshire, during the reign of Queen Elizabeth 1, 'Good Queen Bess', 1558-1603. Surnames became necessary when governments introduced personal taxation. In England this was known as Poll Tax. Throughout the centuries, surnames in every country have continued to "develop" often leading to astonishing variants of the original spelling.